Since genetically modified foods hit the market in the 1990s, allergies have skyrocketed. Studies compiled by Jeffrey M. Smith, head of the Institute for Responsible Technology and author of “Genetic Roulette: The Documented Health Risks of Genetically Engineered Foods” show that common GM ingredients – in addition to synthetic chemical food additives [See 1, 2, 3] – may be compromising the health of ordinary people in the United States and across the world. The video below discusses soy, but that’s just one genetically modified ingredient found in the majority of foods on U.S. grocery store shelves. 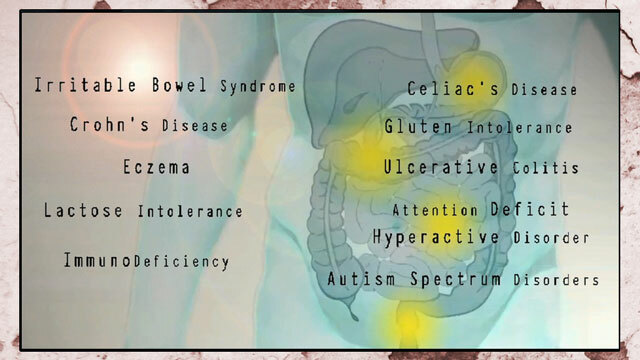 While simple food allergies have become more common or more intense over the past couple of decades, deadly reactions to wheat, corn and soy have prompted the need for major avoidance strategies for sufferers of Crohn’s Disease, Irritable Bowel Syndrome, Celiac’s Disease, gluten intolerance, eczema, AH/HD and many more conditions with common underlying digestive and gastrointestinal triggers. Are genetically modified foods to blame? Consider the research – including the 65 documented health risks of GMO compiled by Jeffrey M. Smith…all while the FDA and biotech industry insist that GMO foods are safe and “substantially equivalent” to traditional foods made without genetic engineering.